Police are calling it an uphill battle to get guns off the streets of Boston. It has been a bloody year on Boston's streets, with four teens killed in the last two months alone. The NBC Boston Investigators recently rode along with the Boston Police Gang Unit to get one view of the complicated picture of gun crime in Massachusetts. It was just before 9 p.m. on a recent Thursday. A quiet night until the radio crackled with urgency. "Two shots fired!" yelled a voice over the radio. "Two shots where?" the dispatcher responded. A triple shooting in Mission Hill. A 19-year-old man shot and killed. Two others wounded. The Gang Unit on the hunt for the shooter. Luck was not on their side and the shooter was in the wind. The radio didn't stay quiet for long. "He’s going down Ruggles! He’s down Ruggles," a gang unit officer cried for help. They had been watching a car they recognized circling a neighborhood and, suspecting possible drug activity, pulled it over. They said the driver took off as the officer approached him on foot. They caught him, but if there were drugs or a gun, they could be anywhere. " "It's the streets," Gang Unit Officer Antoine Ramos said. "It’s intoxicating for a lot of these kids. And this is all they know." The stakes are incredibly high. Fatal shootings are up 23 percent over the same period last year. The 43 people killed this year easily eclipses the five-year average of 35. Police say Boston’s more than 100 gangs fuel much of the violence. The players are getting younger and more reckless. A behind the scenes look at the Boston Police Dept. Gang Unit, as they share their experiences on the city's streets. "This right here," Ramos said, motioning with his trigger finger, "for them this is all the confidence they need, because this is all the power they need when they put that firearm in their hand. This is power for them." The Gang Unit teams crisscross from Mattapan to Southie. The colder months keep people inside or in vehicles. The officers run plates, looking for violations to make a stop. Anything to engage and get intelligence. Who’s in the gang database? Who’s back from prison? They don’t stay in one neighborhood for long. Word spreads that cops are there. As officers pull into a complex in Mission Hill, kids scatter. One disappears into the housing complex. Another gives officers a fake name and the remaining two confirm they are on probation for gun charges. Favors are currency for these officers, who often let drivers go with minor infractions if they think it will pay dividends later. "It gives them respect," Officer Dom Columbo said. "You know it’s a courtesy. That does spread. That does go a long way, I think." 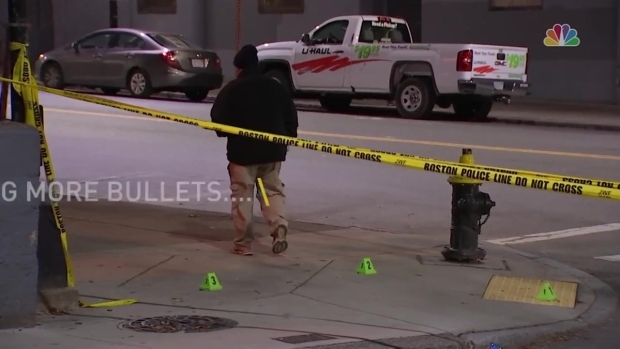 Deadly shootings in Boston have risen 24 percent since last year and police say the shooters are getting younger. But the end game always is a gun off the street. On this night, officers found a firearm during a traffic stop on Blue Hill Avenue in Dorchester. Detective Steve Ridge empties the clip of the gun into an evidence recovery box. Despite strict gun control in Massachusetts, firearms flood the city. We pored over Boston Police records and found that officers have recovered nearly 5,000 guns since 2010. They are difficult to trace. Some were stolen, but far more are purchased legally by straw buyers and then passed on as crime guns, often from states with less restrictive laws. "We see semi-automatic, extended magazines. I’ve seen (weapons) with laser-mounted devices on them," said Ramos. Added Layden, "Last week they got an AK-47 in Dorchester." Police Commissioner William Evans tells us police are seeing more high-capacity magazines in gang-related crime. The clips can hold dozens of bullets, fired with little skill. Said Ramos, "That’s so much power in someone’s hands and they can’t even grasp the concept of what they’re doing. What they could do to you. What they could do to the innocent civilians that are trying to live their lives, just trying to make the best of the community they live in." The officers say they do their best, trying to help the kids they can. It's community policing — they’ll give young men their cards and try to get them into programs. They connect families with city services and play basketball or do other activities with at-risk kids. "I came from the same type of background, you know?" said Ramos, who grew up in the Bronx. "I could have easily, instead of taking that hard right, I could have eased into that easy left and I could have been anywhere. It sounds crazy, but when I place someone in custody and I’m bringing them back to the booking show, for a quick second, I see myself. I see that could be me." It’s an uphill battle that sometimes officers feel they’re losing. "At the end of the day," Ramos said, "we can only do so much."